Dotzot.in: A Delivery Network for Indian E-commerce platforms! Order fulfillment is one of the major issues that Indian E-Commerce platforms face, especially small to medium sized ones! While bigger platforms can afford to build and operate their own order fulfillment delivery network (like Flipkart), for most of the others, it is highly un-feasible. Infact, some of the larger platforms also do not venture into creating their own delivery network. Its expensive and probably takes away much of the focus from the core e-commerce business. To address this need in the market, DTDC has launched Dotzot, India’s first Pan-India Delivery Network exclusively for Indian E-Commerce sites. The service, if delivers as promised, can really play a pivotal role in growth of E-Commerce in India. 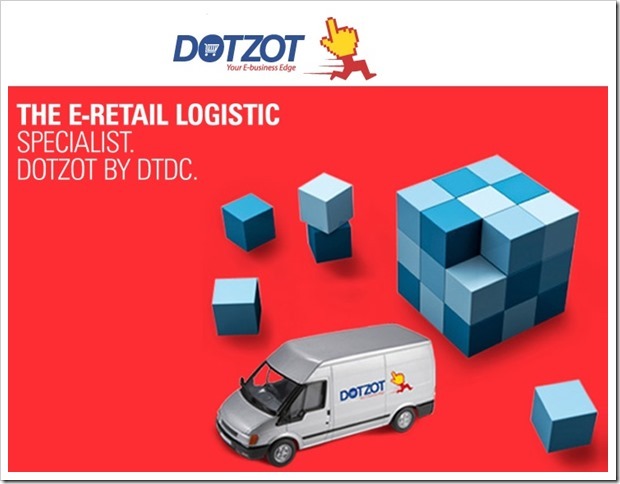 With Dotzot logistics service, e-commerce providers will be able to deliver products to their customers more cost-effectively and focus on growing and retaining their existing customer base. Being a DTDC company, Dotzot already has a delivery coverage of over 8000 pin-codes and 2300 cities in India, which will allow e-commerce companies to ship their products to nearly every nook and corner of India. Dotzot has 3 different variations which E-Commerce companies can offer to their customers – Express, Economy and Premium services. DotZot Express service is for customers who need the product on-time (generally within 2-3 days). DotZot Economy service will offer best rates while Dotzot premium will offer services like same day or next morning delivery at higher costs. In addition to this, Dotzot will also take care of entire return & exchange delivery of products, where products that need to be returned will be picked up the same day from customer and delivered back to warehouse. Dotzot also offers Collect on Delivery, where they will accept payment from customer on behalf of the e-commerce company and will settle with them on monthly reconciliation basis. One of the reasons that many E-Commerce companies (especially the medium & larger sized) will be thrilled with DotZot service is because they also offer warehousing services where DotZot can store the inventory, pick and ship the product where and when the E-Commerce company wants it. Overall, I think, Dotzot is addressing a REAL pressing need of Indian E-Commerce ecosystem – a reliable, cost-effective national logistics partner. Whether they are reliable, probably only time will tell! Indian Policymakers’ Google+ Hangout for Citizen Interaction! I had ordered an spice 516 mobile on homeshop which was send to me through Dotzot courier.the delivery date was 18th of december but till today i,e on 26th of dec.i haven’t got my product which was really disgusting.please help me out in getting my poduct today.. Bunch of losers these Dot zot are..13 days since placing the order.. No update no numbers no replies on filing a complaint ! Hell with all these discount if you don’t receive your consignments on time. That too from Delhi to Pune. God bless Indian markets.. Shame on healthkart for choosing Dot Not as their logistics partners. The Real MESS is e-bay+DotZot, they should hang till death!!!!! DOTZOT is a big scam master. the master mind behind is shopclues. Shopclues is cheating the customers with this fake company. Dotzot – Iss se bakwaas kuch nahi !! I think its a fake service provider. Even my parcel (which i booked thru Shopclues on 21st Oct 2014) status is shown as booked on 02nd Nov 2014, lying at a distance of 5 kms from where it is to be delivered but not delivered till today (11th Nov 2014) – A delay of more than 20 days guys !!!! as if i had booked some International consignment for delivery at Antarctica !! Over all a manner less 3rd class company i think dotzot is not eligible for their work. I am going to swing them in consumer court. Poor service by Dot Zot. Airway bill # 700001249928 is pending with these guys since 23rd Oct 2014. Still not status update god knows when it will be delivered. After reading all reviews of so populer courior company dotzot I m worrying too… bcoz I have booked a watch online but no tracking location no cantact no is available there on the website… So funny I cant undetstand that why online markets use such companies to deleiver items to customer. Dot zot service is as correctly mentioned above, it is pathetic, no contact numbers, no one to deliver. I wonder why e-commerce companies are using this service. They are utterly pathetic and highly irritating bunch of people with zero interest in service. There is no customer care number on the website and they dont even bother to reply to your emails. My item was bagged on 27th of October from Jaipur. Today is 6th of November and i havent received it in Kolkata. The tracker says, the item has reached kolkata on 1st november. Does it take 6 days to deliver in the same city ? Overall, A company with such standards of delivery cannot survive without the loyalty of its customers. The least they could have a number where you can call them up !! I HAVE BOOKED A PRODUCT IN STARCJ ON 3RD AUGUST AND THEY HAD DISPATCHED IT ON 5TH AUGUST 2013 FOR WAGHODIA ROAD, VADODARA. I AM NOT ABLE TO GET THE LOCAL BRANCH OFFICE. BUT THE FUNNY THING IS THAT I HAVE NOT RECEIVED THE MATERIAL TILL DATE I.E. 13TH AUGUST. IF THE ORGANIZATION IS NEW THAN THEY WILL HAVE TO FULFILL THE COMMITMENT TO THE SERVICE PROVIDER AND ENJOYER, AFTER ALL THE CUSTOMER IS HEART OF BUSINESS. BUT THIS IS NOT APPLICABLE TO DOTZOT. Personal experience with DTDC has been very bad for us. We were trying to find any good courier service for OnlineThela.com. We approached them and they said they would come back to us. Finally, they didn’t come back. I hope now, DotZot is going to be good.